Top bar hives (or versions of them) are commonly used in Africa, but also have a fair number of users in the USA and Europe too. In recent years, there has been a growth in the Natural Beekeeping movement, which also advocates the use of top bar hives, in order to allow the bees greater freedom for building their own honey combs and doing away with frames. Are Top Bar Hives Better For Bees? This depends on who you ask! And what’s important for you? As the beekeeper, perhaps you want your own concerns to be addressed. Ability to minimise the risk of colony losses due to diseases, mites, virus? Emulating the natural nesting conditions of honey bees in the wild, as far as possible? Allowing bees to be more in control - e.g. of building their own honey combs? Being able to build your own bee hive? Having the same bee hive as your 'tutor'? 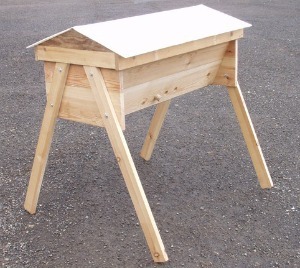 If you are keen to build your own bee hive, and want the bees to make their own comb, top bar hives are a good option. But enough of that! Let’s take a quick look at how honey bees naturally behave in the wild. Honey bees, like many wild species of bee, have to be adaptable to an extent. Hence it is not that unusual to hear of bees making nests in chimneys or in buildings, but what do they prefer? We do know, that honey bees naturally nest in the trunks of trees, or in natural caves and hollows. Honey is stored at the top, the brood nest below, and pollen storage is in between. They coat the inside of the nest with propolis, and comb is fixed at the top and side. Drone comb is located at the periphery of the brood nest. Cell size is variable. Perhaps the ideal bee hive from the perspective of the honey bees, is the one that best enables them to build their combs and organise themselves - as far as possible - as they would prefer. From a beekeeper’s perspective, however, there are practical considerations too, such as inspection, and removing comb, although many beekeepers advocate less interference - for example, see this article: how to monitor a bee hive. There are broadly two types: horizontal and vertical. An example is pictured below. These typically have the shape of ‘long boxes’ with wooden bars upon which bees build the honey combs themselves. The bees are able to build vertical honey combs in such hives, whilst the beekeeper is also able to remove them. In general, perhaps it is this design which most resembles the vertical hollow tree trunk. An example of such a hive is the People’s Hive (or Warre Hive), designed Abbé Warré. This consists of a series of boxes, each one being fitted with top bars. If you would like to have a go at constructing your own top bar bee hives, go to top bar bee hive plans. It's possible to purchase build-your own plans, such as Corwen Bell's Golden Mean Ratio Hive. Check first that you are happy with the amount of materials and equipment provided before purchasing. Corwin Bell has designed a range of top bar hives. He supports biodynamic beekeeping and he says the primary focus "is on improving bee ecology and beekeeping methods that respect the honeybee". Interesting views about beekeeping shared by the author of The Bee-friendly Beekeeper. Author of The Barefoot Beekeeper, and his new book! Share your wisdom for the benefit of other beekeepers here. An introductory page about beekeeping with lots of links to further information and free resources. A must for beekeepers: ensure you have good sources of pollen and nectar to provide lots of foraging opportunities for bees. Links to information about the controversial neonicotinoids, including research resources. Read this information about various campaigns around the world to save our bees.